One day before campaigning kicks off in Tokyo’s closely observed gubernatorial election, major contender Kenji Utsunomiya said he had withdrawn his candidacy to give the opposition a better chance. A former chairman of the Japan Federation of Bar Associations, Utsunomiya had been seen as competing for opposition support with journalist Shuntaro Torigoe, who received endorsements Tuesday from four opposition parties as their unified candidate. “I have decided to withdraw from the race, after judging things from a larger viewpoint,” Utsunomiya told a news conference in Tokyo in the evening. 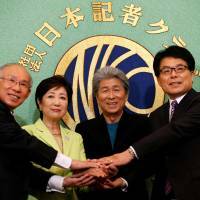 Earlier in the day, four leading candidates including Utsunomiya and Torigoe outlined their campaign promises at a joint news conference. 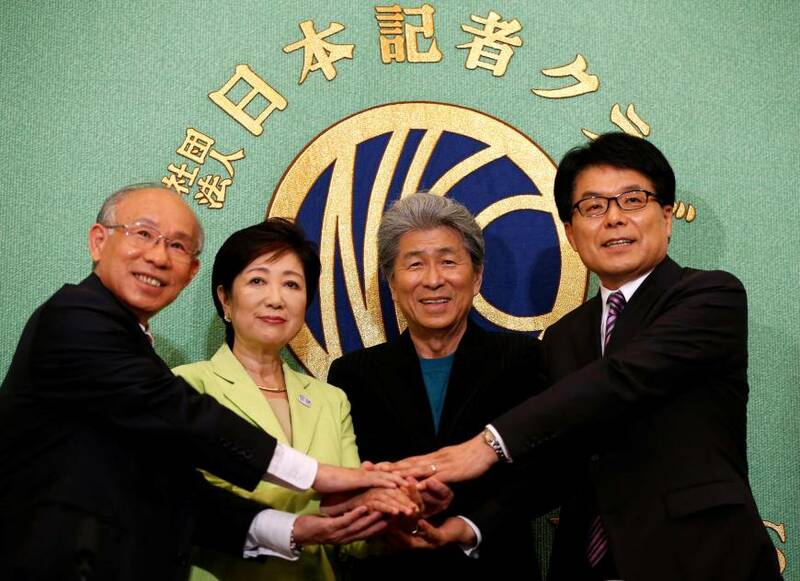 Former Defense Minister Yuriko Koike and former internal affairs minister Hiroya Masuda joined the two at the news conference at the Japan National Press Club in Tokyo. During their joint appearance, Koike stressed her commitment to combating the long-standing problem of Tokyo’s day care center shortage. She added that she will work to improve diversity in the capital. She also called for a revamp of the traditional male-dominated way of thinking that she says plagued her predecessors, casting herself as the candidate who is most capable of thinking outside the box. “What’s wrong with having a female Tokyo governor every now and then?” a confident Koike said, adding that she will push for a tobacco-free Olympics and will remove streetside utility poles that may hinder access by rescue workers after natural disasters. He said that as a journalist, he has campaigned stridently against a state secrecy law enacted in 2014 by Abe’s ruling coalition. He also denied that his lack of political experience is an issue: “Everybody is a beginner at first. But trust me, I know what I want to do as a governor,” he said. As a survivor of advanced bowel cancer, the 76-year-old said he will prioritize encouraging people to undergo cancer screening. Masuda, the former internal affairs minister who will run on a Liberal Democratic Party ticket, said he will draw on his years of experience handling administrative affairs to “put an end to the chaos” that Tokyo suffered when past governors resigned before their terms were up, some of them in disgrace over accounting scandals. “I have dealt with administrative matters for years and I have the ability and responsibility to carry through on the policies I promised,” the former Iwate governor said. He vowed greater transparency in financial matters to realize a “cleaner”state of affairs in politics.